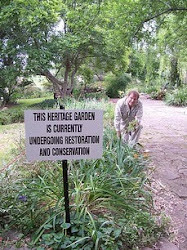 In 2011 I published some old images of the Botanic Gardens in Sydney. I began collecting horticultural themed postcards nearly twenty years ago after reading an English book titled Postcards from Kew. This well illustrated work highlighted a large collection of old postcards of the Royal Botanic Gardens in Kew, London. 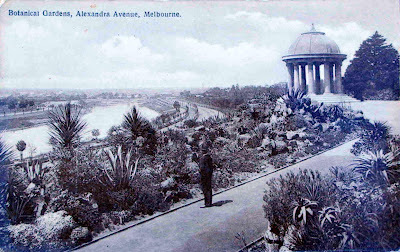 As a gardener I was intrigued by these images and went in search of Australian examples at markets and postcard fairs. Within a couple of years I had a collection of several hundred cards. While most of my collection is dominated by views of the Royal Botanic Gardens in Sydney I also have many images of other gardens around the world. 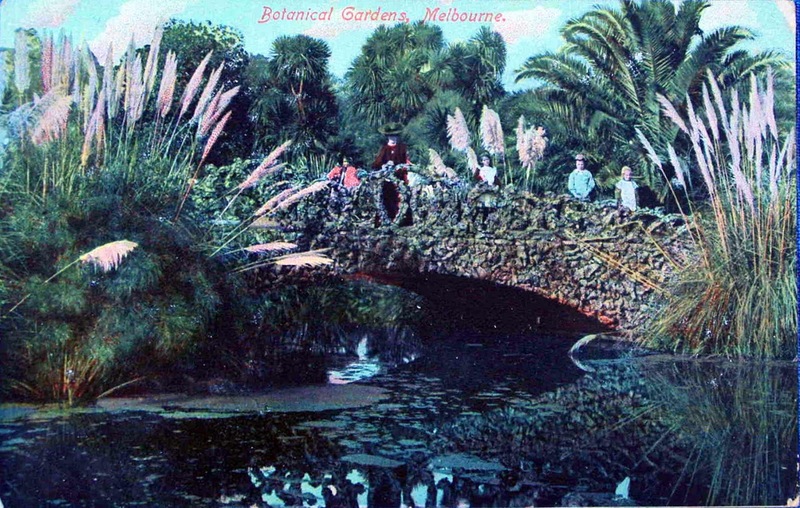 Here are a few postcards depicting the Royal Botanic Gardens, Melbourne. 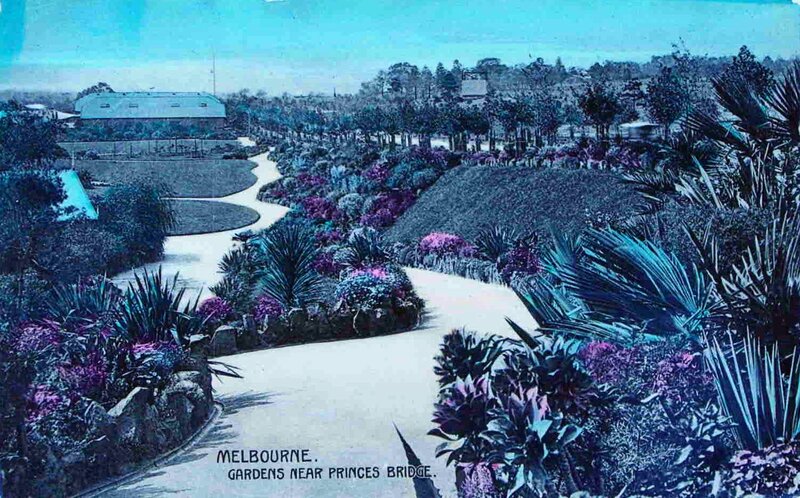 The Botanic Gardens in Melbourne was officially opened in 1846. One of the most popular parts of the 96 acre site is the view from the Temple of the Winds. 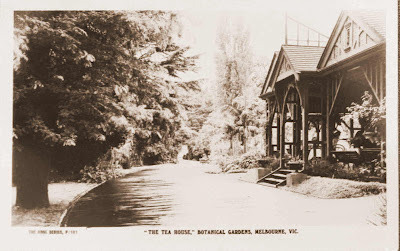 This classically influenced structure was built in 1902 as a tribute to the former Victorian colonial governor Charles La Trobe who selected the site for the gardens. Many general views of the gardens show large numbers of people enjoying the grounds. 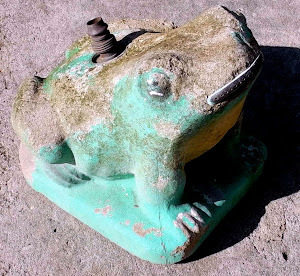 As one of the conditions of entry proscribed the consumption of alcohol or tobacco within the garden, this may explain its popularity with visitors, especially mothers and children. Much of the lush tropical plantings in the gardens date from the time of William Guilfoyle who was Director of the Botanic Gardens from 1873-1909. The blue-toned image above shows some of the plantings near his residence in the grounds. Sucullents were a popular planting in the gardens during the 19th century but lost popularity in the early years of the 20th century when they became associated with the weedy spread of prickly pear in the country. 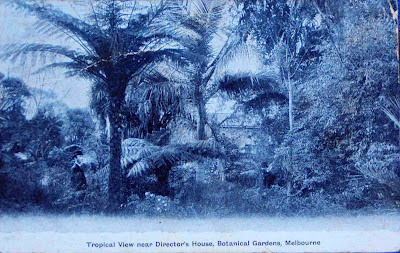 Old postcard views of the garden often highlight lost buildings and other garden structures. Above we see a view of the Tea House which was opened in 1900. Sadly, this building was destroyed by fire in 1970. Along with general views of the gardens the conservatories were also popular with visitors. 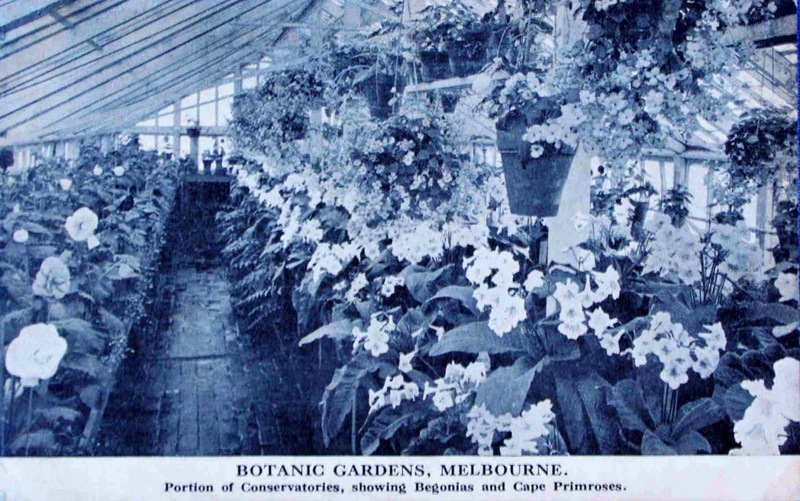 Here we see one such greenhouse filled with a winter display of Bergonias and Cape Primroses.